IoT commercialization accelerator ImpactLABS recently appointed 25 thought leaders from diverse industries and stakeholder groups to its advisory board. Advisors have been selected for their ability to support the ImpactLABS mission: Accelerating IoT deployment to address grand challenges profitably, and with resilience. The advisory board members represent ImpactLABS sponsors, partners, and portfolio companies and are each among the most experienced operators in their markets. Anthony Sapienza, Senior Advisor, Joseph Abboud Manufacturing Corp.
Marian Singer, Co-founder and CEO, Wellntel, Inc.
Advisor bios and information can be found on the ImpactLABS website. "I am thoroughly excited to be part of the ImpactLABS Advisory Board and support the mission of marrying the digital and physical worlds with instrumentation and engineering knowledge to foster economic resilience and sustainability." "ImpactLABS' focus on nurturing and growing the early stage IoT companies needed to help the world intelligently monitor and sustainably manage resources is vital, and I’m looking forward to working with this dynamic, smart, and fun team." "Our work with ImpactLABS is a crucial aspect of our ability to commission, test and prove our sensor systems in live situations as we continue our journey to sense, measure, and connect critical infrastructure." "Many emerging approaches exist for managing flood damage, food security, soil carbon storage, and nutrient pollution. However without the ability to model, monitor, manage, and verify how large landscape scale systems (think the entire Mississippi River basin or San Francisco Bay area) function, it's not possible to make a compelling case for them. I am excited to be an advisor to ImpactLABS because they are working to merge IoT technologies with living green infrastructure methods from farms to cities." 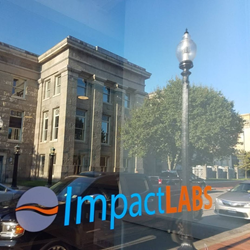 Located in New Bedford, MA, ImpactLABS deploys early stage IoT solutions with small and mid-sized businesses in Southeastern New England and a number of regional markets globally. From ImpactLABS-funded pilots to joint-funded commercial programs with paying customers, we are helping the most innovative small and mid-sized enterprises to build more profitable and sustainable businesses independently, and with their F5000 strategic partners. All ImpactLABS work is documented to evidence technical, operational, financial and social impact and exponential impact.